Tooheys New is the subject of a new beer ad from Australia, this time based on the rugby field. The ad is set in the context of “Rehearsal No. 36”. Five players recreate a try (placing the rugby ball over the ‘try line’), sparking off a celebration from their team mates and supporters. By celebration I mean acrobatics, balancing acts and general drinking of Tooheys New beer. 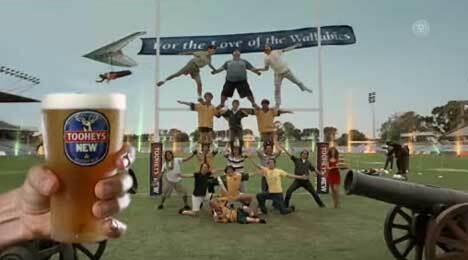 The ad is given its quirky nature with the addition of a beer-drinking dwarf, couple of cannons, a stag on the podium, and a fly-by banner “For the Love Of the Wallabies“. I’m not too sure how this fits in with official polices relating to mixing alcohol consumption with playing rugby on the field. The Post Try Celebrations spot was developed at Saatchi & Saatchi Australia, Sydney, by executive creative director David Nobay, art director Pete Buckley, senior copywriter Tim Brown, agency producer Scott McBurnie. Filming was directed by Jim Hosking via Revolver Film with executive producer Michael Ritchie, producer Yolande Dewey and director of photography Danny Ruhlmann. Editor was Stewart Reeves at Guillotine Post. See the ad online at www.tooheysnewworldrecord.com.au.